"I can't believe you contacted me back this morning for no reason other than being sure I didn't need you. Kudos to you on a new future customer. Thank you." "You are awesome! I was delighted to see the order arrive yesterday. Thank you very much for your outstanding service, I will go to you first in the future. Regards"
"Installed drive, no errors! Runs great, thanks for the quick turnaround. I told our AMADA salesman about your repair service, maybe he can send some more work your way." "Thank you for a well-executed and pleasant transaction. You were a tremendous help in getting our machine up and running again and I personally appreciate it! Best Regards"
"Thank you for your swift and kind reply. I appreciate your time and courtesy!" "I really appreciate all your hard work - you are making us look very good to our customer!" "Thanks for the fast turnaround!" "To Everyone at TRW Electric and Supply Company, I wanted to thank you all for your support and quick response anytime we have an issue!! Your inventory of hard to find parts and the timing you're able to ship them out has saved us from shutting down our customer on more than one occasion. Being able to receive repair parts next day is a key component of being successful in the auto industry. Thank You Again!!" "You're always a great help. Thanks for everything you do." "What fantastic news. Thanks so much for your persistence and understanding of the need for them. Please, ship them together when possible. Joe has gone to work with a smile on his face so you have made his day. Thanks." "I look forward to our next purchase with you for you have been very helpful. In our next need interface communication need I have my 1st source to call. Thank you." 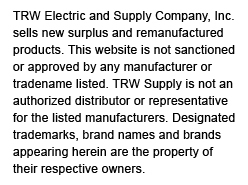 "You've been so helpful & I look forward to doing more business with TRW." "You guys have always been very helpful and I appreciate the service and availability of items you have provided." "Thanks Patrick! You guys are Awesome! The best customer service I've ever experienced with not just one sales guys but with Two. (Bryan & Yourself) Thanks so much for getting this shipped today." "I just wanted to reach out and say thank you for expediting my order and getting it sent out. It arrived this morning, has been successfully installed with no problems or negatives, and we are now back into production. You guys are rock stars, and we are very pleased customers!"